How do population, water, energy, food, and climate issues impact one another? What can we do to address one problem without making the others worse? 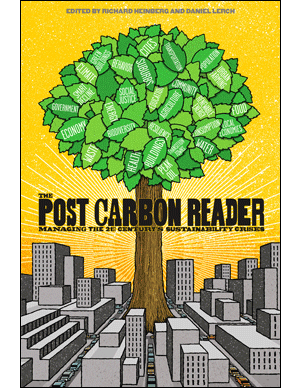 The Post Carbon Reader features essays by some of the world’s most provocative thinkers on the key issues shaping our new century, from renewable energy and urban agriculture to social justice and community resilience. This insightful, award-winning collection takes a hard-nosed look at the interconnected threats of our global sustainability quandary and presents some of the most promising responses. The Post Carbon Reader has proven to be a valuable resource for policymakers, college classrooms, and concerned citizens. Published by Watershed Media in collaboration with Post Carbon Institute. Distributed by Publishers Group West. Fall 2010. 544 pages. ISBN 978-0-9709500-6-2. Most of the chapters are available for free online at Scribd. Page 34, image caption should read, “…degree of connectedness…”; this has been corrected as of the third printing. Page 324, first line in the body text should read “…fossil-fuel use…”; this has been corrected as of the second printing. Page 480, the Web page referenced in endnote 10 is no longer available; a cached version can be found here and various mirror copies are available here.